Bits of Torah Truths, Parashat Pekudei, Do you believe we are Grafted into Israel? This weeks reading is from Parashat Pekudei (Shemot / Exodus 38:21-40:38), the Scriptures detail the materials for the construction of the Tabernacle (38:21-31) and lists the construction of the priestly garments (39:1-43). Shemot / Exodus 40:1-33 describes how the tabernacle was Erected after the various parts were constructed. The last paragraph of the book of Exodus, and of the Torah portion describes the glory of the Lord descending upon the Tabernacle (40:34-38). What an awesome moment in history this had to have been to personally witness the glory of God descending upon the Tabernacle in the wilderness. The Scriptures for this week describe the Tabernacle as the “Mishkhan Ha’edut” (מִשְׁכַּן הָעֵדֻת) saying literally, this is the “Tabernacle of the Testimony.” The NASB translates this verse adhering closely to the MT rendition. The NIV translation however translates this Scripture in a slightly different way. The construction of the Tabernacle is a very significant point in Israel’s history. In addition, the translation of the Tabernacle of the testimony is also very significant for our understanding of what is taking place between man and God. How significant can the translation into English effect our understanding of the Scriptures? For those who study the Hebrew Bible, the Hebrew text in most places is very clear and concise. We find here at the end of the book of Exodus the point and purpose of God’s delivering Israel; the purpose was so that He would be their God and they could be His people. The description of the Tabernacle as the “Mishkhan Ha’edut” (מִשְׁכַּן הָעֵדֻת) the “Tabernacle of the Testimony,” as opposed to the NIV translation of “the Tabernacle of the Covenant Law” has significant implications on the interpretation of the Scriptures. Can you think of what that might be? 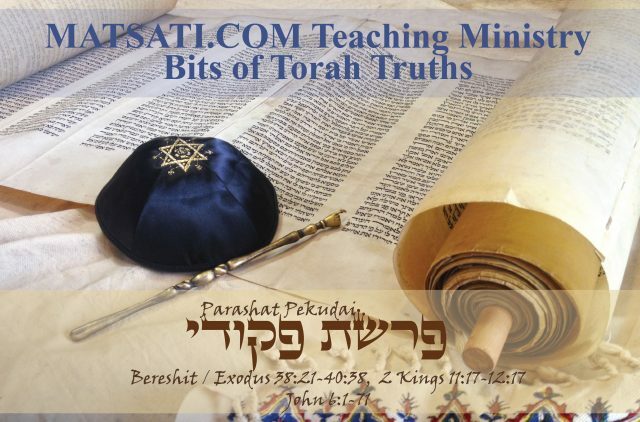 The Rabbis according to Midrash Rabbah Shemot provide us with some insights into the translation of these important words of the Tabernacle of the Testimony (Midrash Rabbah Shemot, Parashat 51, Part 4, מדרש רבה שמות פרשה נא סימן ד). What is the meaning of testimony? Said rabbi Simeon, son of rabbi Ishmael, It is a testimony to the whole world that there is forgiveness for Israel. Another explanation, It is a testimony to the whole world that he (Moshe) was appointed by God (to erect) the Tabernacle. Rabbi Isaac said, It can be compared to a king who took a wife whom he loved very dearly. In the course of time he became angry with her and deserted her, and her neighbors taunted her saying, He will no longer return to you. Subsequently, the king sent her a message, Prepare my palace and make the beds therein, for I am coming back to you on such and such a day; and when that day arrived, the king returned unto her and became reconciled to her, entering her chamber and eating and drinking with her. Her neighbors at first would not believe all this; but when they scented the fragrant spices, they at once knew that the king had become reconciled unto her. In like manner did God love Israel, bringing them before Mount Sinai, giving them the Torah and calling them kings as it says, And you will be unto Me a kingdom of priests (Shemot / Exodus 19:6), but after only forty days they sinned. The heathen nations then said, Bot will no longer be reconciled unto them, as it is said, Men said among the nations, They will no more sojourn here (Lamentations 4:15). But as soon as Moshe pleaded for mercy on their behalf, God forgave them, for it is says, And the Lord said, I have pardoned according to your word (Bamidbar 14:20). Moshe then said, Master of the World, I personally am quite satisfied because You have forgiven Israel, but do You please announce the fact to all the nations that You have no more resentment against Israel in Your heart. The Divine reply was, As you live, I will cause My Shechinah to dwell in their midst, for it says, And let them make Me a sanctuary, that I may dwell among them (Shemot / Exodus 25:8). By this will all nations know that I have forgiven them. This is why it says, The Tabernacle of the testimony, because the Tabernacle was a testimony to the Israelites that God had pardoned their sins. The rabbis open in Part 4 of Midrash Rabbah Shemot, Parashat 51 asking the question “what is the meaning of testimony?” The answer is that “it is a testimony to the whole world that there is forgiveness for Israel.” Another rabbi says that this is a testimony to the whole world that Moshe was appointed by God to erect the Tabernacle. Another says it is compared to a king who took a wife whom he dearly loved. Finally, the Lord’s response to the question on the meaning of testimony is “As you live, I will cause My Shechinah to dwell in their midst, for it says, And let them make Me a sanctuary, that I may dwell among them (Shemot / Exodus 25:8).” The “Tabernacle of the Testimony” describes the “dwelling place of the Testimony of God.” If we consider these words for a moment, from an Apostolic Writings (NT) perspective, keeping His word hidden in our hearts and abiding in the Word and in Yeshua the Messiah, we have a Torah based understanding that the Lord, His glory, will dwell in our midst. This is a very rabbinic concept that is described in the Apostolic Writings. The Testimony of the Tabernacle, according to the rabbis, is paralleled to all the world (all of creation) knowing of the forgiveness that God has given to Israel. The idea of forgiveness being found in Israel is a very significant concept. According to the Talmud Bavli Avodah Zarah 2b and Midrash Rabba Bamidbar Parashat 1, Part 7, the rabbis state that our Father in Heaven offered the Torah to all the nations of the earth, and the Jews were the only ones who accepted it. Note also that, according to the rabbis, this was the purpose of the wilderness revelation of Torah, that the nations would come to seek the Lord God Almighty at His holy hill. The nations of non-Jewish peoples would seek the God of Israel, and Israel’s Messiah for His Salvation and for the forgiveness of sins. Within the Rabbinic literature is contained the idea that God intended His Torah for all men (both Jew and non-Jew). In similar fashion, within the Apostolic Writings, we see the Apostles teaching Torah by exhorting the believers (ekklesia) to live in righteousness, holiness, and truth. These are very important concepts in light of what the Apostle Paul says to the Romans in Romans 11, and the way in which we enter into a covenant relationship with God, and the modern concept of the church and the individualized salvation. The Apostle Paul said the following in Romans 11 regarding salvation, Israel, and the non-Jewish believer. Paul begins asking if God has rejected His people? He response is “NO.” He goes on to argue that the Lord God has always preserved a remnant of people for Himself from among the unbelieving Israel. He says it is by the transgression of Israel that salvation has come to the Gentiles to make Israel jealous (11:14). He goes on to say that by the rejection of the Messiah comes the reconciliation of the world (11:15). He continues saying those who reject Yeshua as the Messiah, they are like a branch broken off, and those who believe and receive the Messiah, they are like branches who are grafted in (11:17). Paul speaks of being arrogant towards the natural branches, the non-Jewish believer is not to be arrogant towards the branches because it is not the grafted in branches that supports the root (11:18). Notice how the replacement theologies teach the church supports the root in opposition to these Scriptures. Paul however concludes that the root supports the branches and not the other way around. Salvation is found in Israel, in the Lord God of Israel, and in His Messiah. By faith in the Messiah, we are grafted into a cultivated tree (Israel), and we stand as a grafted in people by faith, we are not to be conceited, and we are to fear the Lord (11:20). Paul concludes saying his comments are to keep the grafted in one’s humble, and to understand the mystery, that a partial hardening of Israel is for the purpose of bringing in the Gentiles. He says that 11:26 … all Israel will be saved; just as it is written, ‘The Deliverer will come from Zion, He will remove ungodliness from Jacob.’ (NASB) Paul is making a rabbinic argument on the fulfillment of Scripture, where the purpose of the wilderness revelation of Torah, was so the nations would come to seek the Lord God Almighty at His holy hill, and this has been achieved by the nations in Yeshua the Messiah one may enter into a covenant relationship with God in His Messiah. Parashat Noach, Having trouble hearing the Lord?